Tom Marzolf, Reading More Than Greens Tom Marzolf, president of the American Society of Golf Course Architects, keeps two books within easy reach. The Bible is one. Golf Architecture, by course design pioneer Alistair MacKenzie, is another. Marzolf tells Liane Hansen what else he enjoys reading. 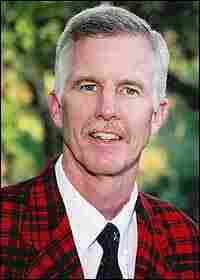 Tom Marzolf is president of the American Society of Golf Course Architects. His recent projects include the Ritz Carlton Members Course in Sarasota, Fla., and The Green Monkey Course in Barbados. He prefers self-help books, and also does a lot of reading with his 10-year-old daughter, Clara. Golf Architecture by Alistair MacKenzie, designing the courses at Augusta National in Georgia and the Royal Melbourne in Australia, among others. "I pick this book up all the time, whenever I have a question or I'm re-thinking about how I should build a golf hole... He was a forward-thinking gentleman." Marzolf and his 10-year-old daughter, Clara, read Harry Potter and the Sorcerer's Stone every night. Clara is also working on the fourth book in the series, Harry Potter and the Goblet of Fire. Father and daughter also enjoy reading Zoobooks and Highlights magazines together. Leadership and Self-Deception, the Arbinger Institute. "What I've taken from it is, it helps you to stay focused in the moment, stay focused on the person that's in front of you, and try to be open and sincere." Common Sense on Mutual Funds, by John Bogle, founder of the Vanguard Group. "It's a great book for any point in your life. The book is a good explanation of how fees can eat into your nest egg for your retirement. It also walks you through an understanding of the bond market, and setting long-term goals." Welcome to the Monkey House, by Kurt Vonnegut Jr.